A bit of everything. Balance adjustments, interface improvements, new art assets, new character names, bug fixes, etc. – [feature] Ethnics for characters (different name themes). Now characters can have different flavours of names. 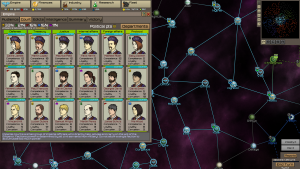 – [balance] Slightly increased the effect of Fleet budget (finances). – [balance] Doubled trade income. – [misc] All fleets start with default squadron composition (to avoid confusion). – [interface] Added tonnage per squadron (and projected tonnage) to Shipyard tonnage tooltip. – [interface] More art assets for character portraits (hair and beard styles). – [fix] Sometimes sound not playing on game logo screen. – [fix] Autonomous fleet sometimes ignoring cancel conquest order. This entry was posted in New Version, Stellar Monarch on December 13, 2017 by Chris.